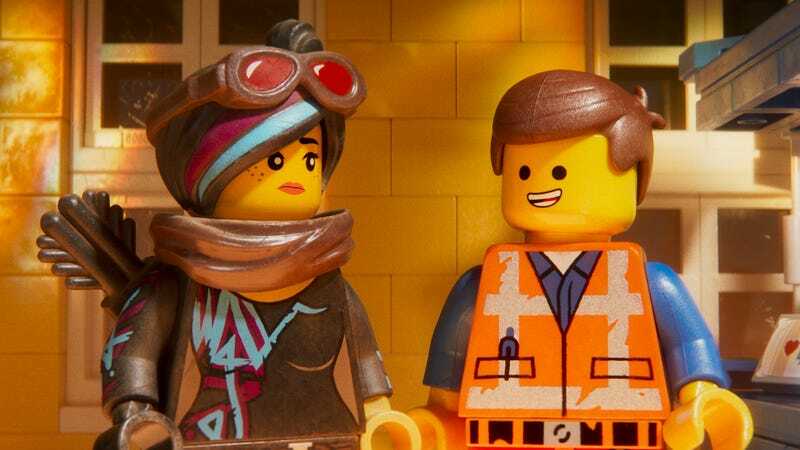 The first Lego Movie is so good there’s a chance you don’t remember just how good it was. Not only did it tell a smart, hilarious, original story with a wildly famous IP, but it was filled with heart, eventually revealing itself to be a deeper story of a boy and his father bonding and the nature of the toy brand itself, as both a child’s plaything and an adult collectable. The movie is legitimately genius. That said, going into The Lego Movie 2: The Second Part, it felt like a long shot that the sequel could do it again. How could writers Phil Lord and Chris Miller, this time aided by director Mike Mitchell, once again tell a story that’s surprising, funny, works on multiple levels, is simple enough for kids, but also complex and meaningful for adults? That could never happen, right? Well, in a shocking twist, it does. It really does. The Lego Movie 2 is a hilarious, clever, emotional sequel—though it takes a little bit to get there. Lucy and Emmet may be having some relationship issues in The Lego Movie 2. The biggest problem with The Lego Movie 2 is that it’s not The Lego Movie 1. Meaning, in the five years since that movie was released, we’ve seen two other feature-length Lego movies and have become more or less familiar with the animated style and level of witty humour. We know to expect cameos. We know to expect meta-commentaries. This time, we know the Lego story is being controlled by people in the real world. When the first movie came out, that was all a surprise and it just added to the whole package. The fact that The Lego Movie 2 is kind of just another Lego Movie does hold it back a bit. The sequel picks up at the very end of the first Lego Movie, where the real world father (Will Ferrell) allowed his real world son (Jadon Sand) to play with his Legos on the condition that his younger sister be allowed to play too. The revelation of her crudely made Duplos (Lego’s brand for very young kids) invading Finn’s world is where that film ended, and this film starts off. From there the film is basically what you’ve seen in the trailers. Years have passed and, largely because of the Duplo invasion, the “Everything is Awesome” city of Bricksburg has become the Mad Max/Planet of the Apes influenced Apocalypseburg. 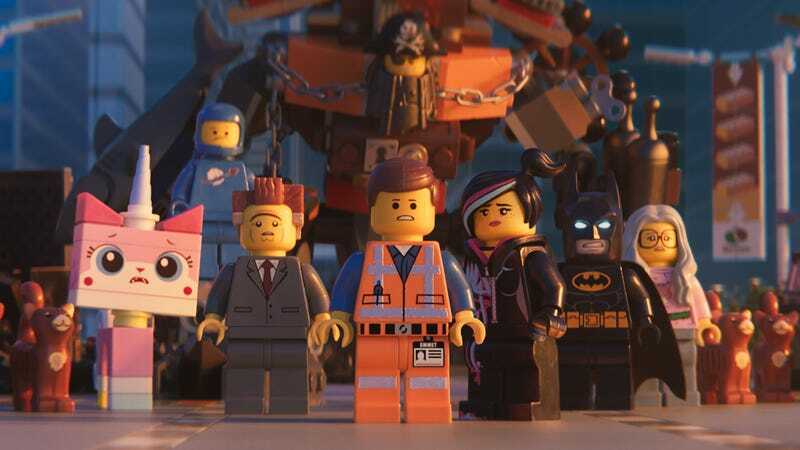 Everything is not awesome, especially when an alien ship comes down and kidnaps Emmet’s (Chris Pratt) friends Wyldstyle (Elizabeth Banks), Batman (Will Arnett), Benny (Charlie Day), Metalbeard (Nick Offerman), and Unikitty (Alison Brie). Emmet then goes into space to try and save them, eventually running into a character named Rex Dangervest, who is kind of the amalgamation of all of Chris Pratt’s roles that aren’t Emmet from The Lego Movie. Rex then teams up with Emmet to rescue his friends from the evil Queen Watevra Wa-Nabi (Tiffany Haddish). Boil that down and the story is about a hero going to rescue his friends from a villain. It’s as straightforward as plots come, and for the first act of The Lego Movie 2, feels slightly underwhelming. But that doesn’t mean that’s all you can expect from the story. As things move along, a shift starts to happen. First, it’s with an oddly out-of-place phrase. Next, a jarring quickly edited image. And slowly but surely, The Lego Movie 2 starts to become like a well-wrapped present on Christmas morning. As the main rescue mission goes on, it becomes very, very obvious the film is not really about that at all. Something else is happening simultaneously. Something more heartfelt. And something I certainly don’t want to even come close to revealing. Queen Watevra Wa-Nabi has more to her than meets the eye. To be fair, because the audience knows and the film doesn’t shy away from the fact that the Legos are being controlled by real kids, the secondary layer is fairly easy to decipher after a few minutes. Again, it’s the curse of being “The Second Part.” And yet, even when you start to guess exactly where things are going, the film surprises you. Then it surprises you again. And by the time you get to the end, even though the movie went where you might have expected, it did it in such a smart, roundabout way that it feels just as rewarding if you didn’t see it coming at all. Once the film heads into space, the main story you thought was so simple has a few twists of its own, too. Rex Dangerfest is certainly not what you’re expecting as a juxtaposition to Emmet. Queen Watevra Wa-Nabi has more than a few layers to unravel. 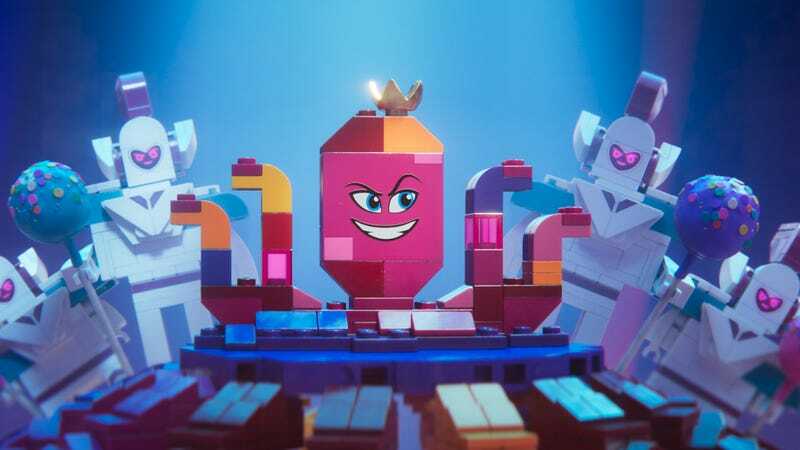 Also, you’ll be happy to hear that The Lego Movie 2 is partially a musical with multiple large musical sequences, each one catchier than the last, leading up to a contender for funniest end credits song of all-time (from Beck and the Lonely Island). Several different types of animations are used this time around, giving the film a more dynamic scope. The new worlds Emmet and his friends discover present all kinds of bright, enjoyable visual possibilities, resulting in much of what you thought you knew about these characters changing rather radically. Basically, by the end of The Lego Movie 2, everything about The Lego Movie 1 looks small and simple by comparison. Things are about to change for everyone in The Lego Movie 2. That The Lego Movie 2: The Second Part is even close to as good as the original film is kind of a miracle. But that’s what writers Phil Lord and Chris Miller do. They take impossible situations (like making movies about 21 Jump Street or Lego bricks, and then make sequels to those movies) and make them not just possible, but maybe even a bit profound. They and their team have done it again with The Lego Movie 2, a film that is almost on par with the brilliant original, which is a very worthy achievement indeed.